The Envy laptops represent HP's latest premium range, and the Envy 15 is an extremely stylish laptop that successfully marries excellent performance with usability and portability. The chassis is fantastically well built, with both the lid and body having been crafted from aluminium. This means great protection for the screen and internal components, combined with excellent looks. A patterned finish has been used which won't appeal to all, but we like it. The 15.6-inch screen features a 1366 x 768-pixel resolution, which is sharp and detailed. The panel isn't particularly bright but this isn't too much of an issue, however, as the shiny Super-TFT screen coating suppresses reflections well. Due to the design of the hinge, the lid doesn't fold back far past 90 degrees, making it sometimes difficult to get a decent viewing angle in some situations. This machine provides one of the best typing experiences we've come across in a while. HP has used almost the full width of the chassis and the result is a very spacious keyboard. The large keys travel a satisfying distance and prove intuitive to use. The touchpad is large, and supports multi-gesture technology, meaning you can use your fingers to zoom in and out of photos and scroll through documents. Intel's latest processing technology is in evidence courtesy of a quad-core Core i7 processor. When combined with the 4096MB of DDR3 memory, the Envy produces fantastic performance. This is even more impressive considering the thin form factor of the machine, which measures a mere 28mm deep. The latest and most resource-intensive applications and programs run without issue, and the use of a dedicated ATi graphics card also means that this laptop can easily run powerful games. The 320GB hard drive gives you plenty of space to store all your digital data and, although there's no in-built optical drive, an external DVD drive comes as standard for accessing and writing data to CD and DVD. Portability is impressive and the chassis only weighs 2.4kg, which is astonishing considering the metal build and the quality of the components employed. While not spectacular, battery life is decent and you'll get 149 minutes between charges. 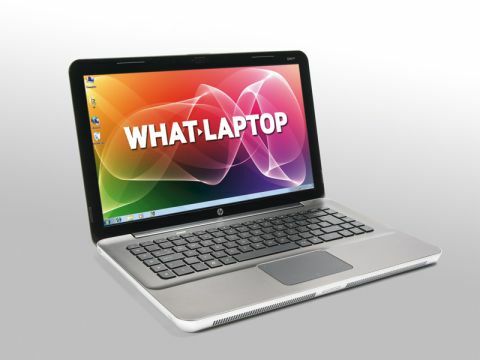 Other features include a night vision webcam and HP has implemented its own software theme over the Windows 7 interface. We don't like this, however, as it's difficult to change and its drab colours may prove difficult to see for some. Nevertheless, this is a small blemish and the HP Envy 15 impressed us enormously with its style, performance and portability – the price is also competitive.